Pilates for man or woman or child! Pilates exercises are not exclusive for any particular race or gender. Everyone can reap the benefits of Pilates! If you are a man and are not doing Pilates then you are really missing out. 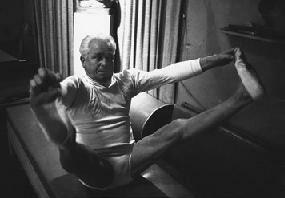 For one thing, Joseph Pilates was a man, and a very strong, fit, and able bodied right up to his death in his 80's man! Pilates can be a great way to improve your flexibility while strengthening the core or powerhouse of the body. Just look at Joe here in his 70's! The exercises are done with a low number of repetitions focusing instead on precision of each movement and working to a full range of motion to increase your flexibility. Many muscle groups are worked simultaneously and this will help to improve not only your flexibility, but coordination as well. Because men are most concerned about keeping their strength, especially as they age, it’s important to know that Pilates not only stretches the body but strengthens the muscles at the same time in that elongated state. Wonder why Tiger Woods looks so lean and mean? 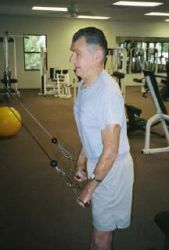 Because he understands that short tight looking muscles do not function as effectively as ones that are strengthened in a stretched or elongated state. So, if you want to improve your consistency in golf, tennis, ball games or just feel better after biking, hiking, running, swimming, etc. start doing Pilates for man and see the improvement in your golf scores for yourself. Pilates exercises are well known to realign the spine through working on the length/tension imbalances in muscles. What this means is that if you are going to a chiropractor on a regular basis he is aligning your spine. But then what are you doing to keep it that way? Pilates for man helps to stretch the tight muscles along the spine and strengthen the weak ones in effect, straightening out the spine like a chiropractor. But this is more permanent and you are in control! 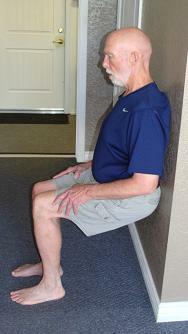 Because men tend to be less flexible than women, and specifically through the hips and hamstrings that pain and tension can be felt in the lower back. When you do Pilates for man exercises consistently over time the flexibility in these areas and throughout your body will improve helping to decrease the pain and tension in your lower back for good. 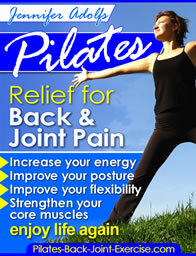 Find out more about how Pilates exercises can improve your back health here. Pilates exercise for men are good at moving the body through a sequence of exercises that are designed to increase the circulation throughout the body. Through this series of controlled, flowing, breathing movements your senses will awaken and the increased stimulation to your mind and body will make you feel more alive. We all notice a shift in our metabolism as we age, and for men, around age 40 things change and it's not as easy to keep weight off. As you practice your new Pilates routine you will notice increased muscle tone in your body. This increase in muscle to fat ratio will help to stimulate your metabolism even at rest resulting in an increase in calorie burning throughout your body. The benefits of Pilates are in your pant size. Cinch up that belt a little tighter! Pilates for man can be something new and exciting for a man who has been going to the gym and hitting the weights for years. Sometimes just trying something new can stimulate the wanted changes in your body and your outlook. 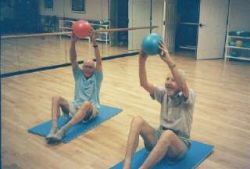 Just look at these fellows in their 80's having fun doing their Pilates routines! Because Pilates exercises focus on breathing throughout each exercise to properly execute each movement with precise concentration you will notice an increase in your breathing capacity. This can result in less breathlessness when you are doing everyday chores, sports activities, climbing a mountain, or anything else that you may enjoy doing. Leave Pilates for Man and get your Pilates ebook here with loads of pictures and descriptions to get you started safely.